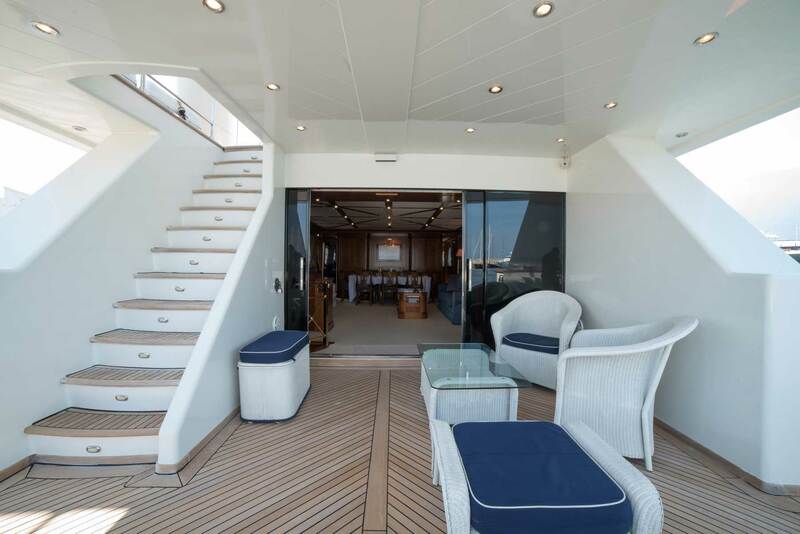 SEA WISH is a 36 m semi-displacement charter yacht, designed by Patrizia Boscolo and Dondi Dall'Orologi with outdoor living in mind. 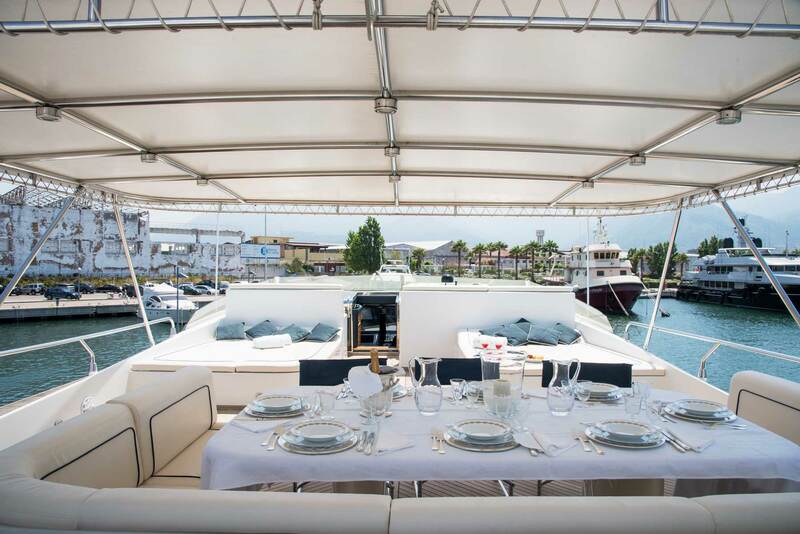 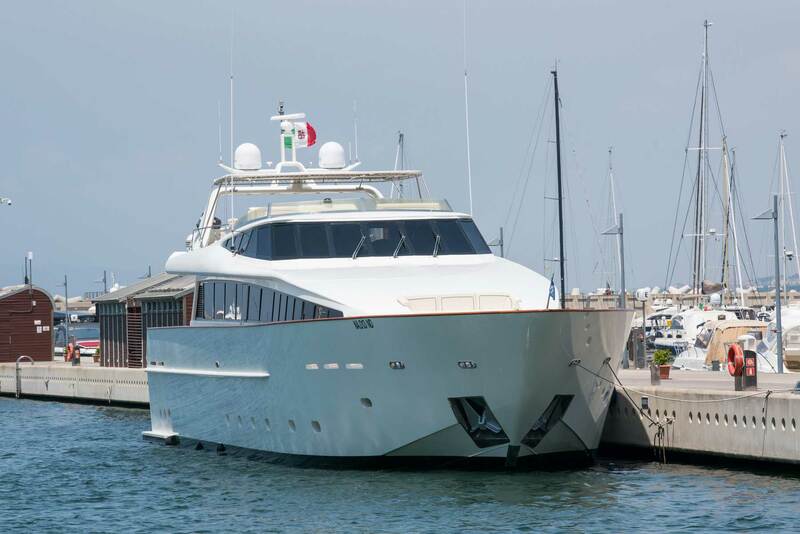 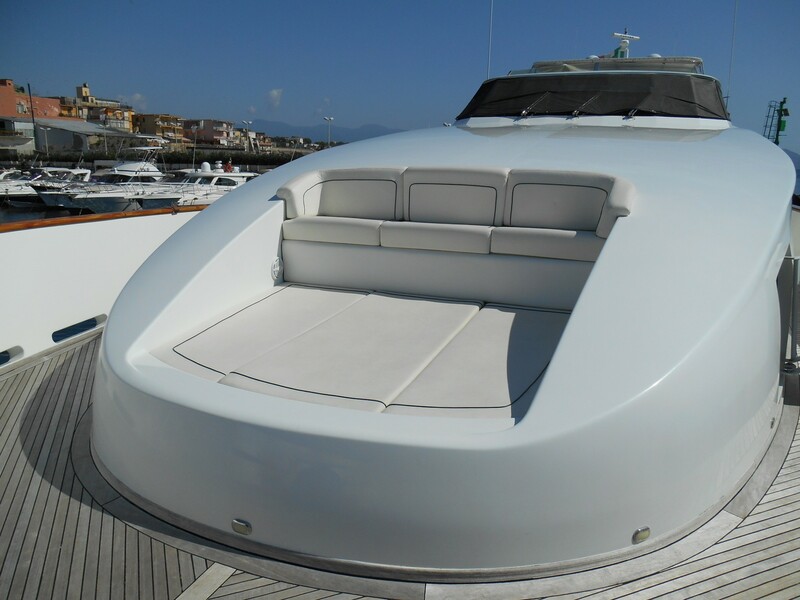 The luxury motor yacht has several areas for sunbathing or relaxation, as well as a large shaded dining table on the sundeck. 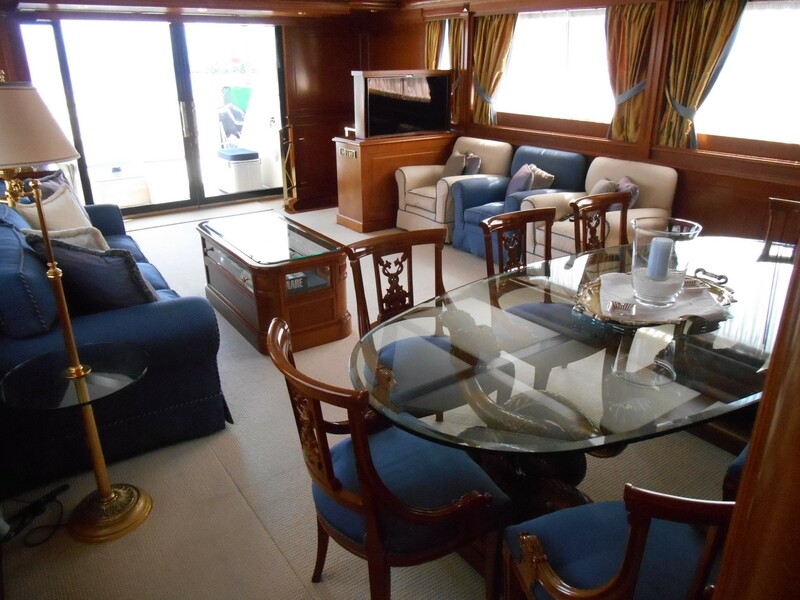 She offers accommodation for a total of 12 guests. 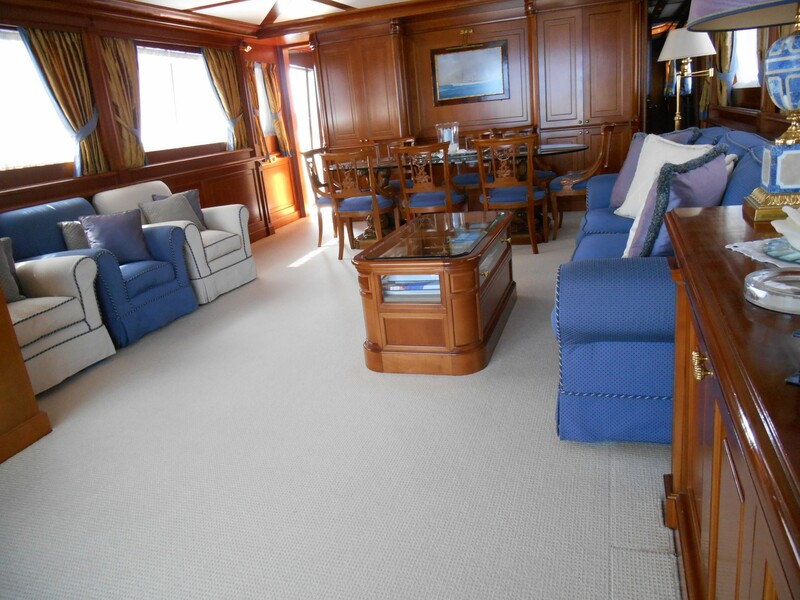 SEA WISH offers wide interior living areas. 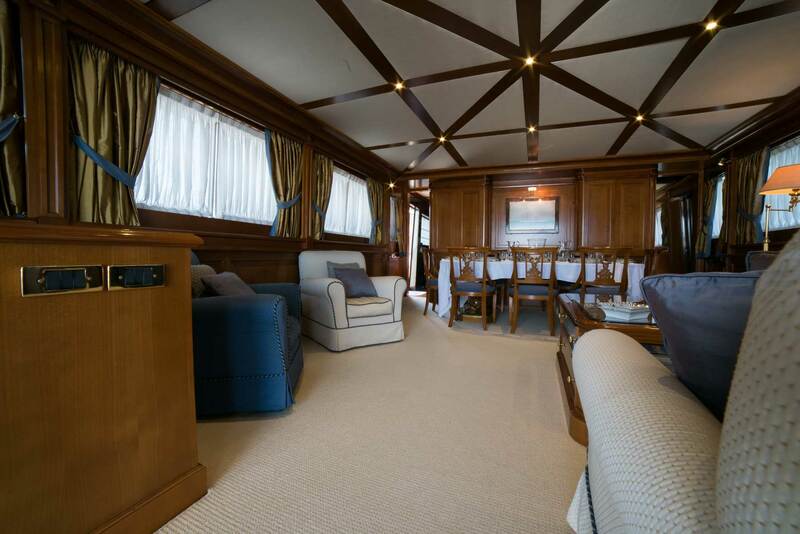 The main salon, very lightful due to the big panoramic windows, features a large glass dining table seating 10 guests, a comfortable sofa with a coffee table and three armchairs, TV and stereo system. 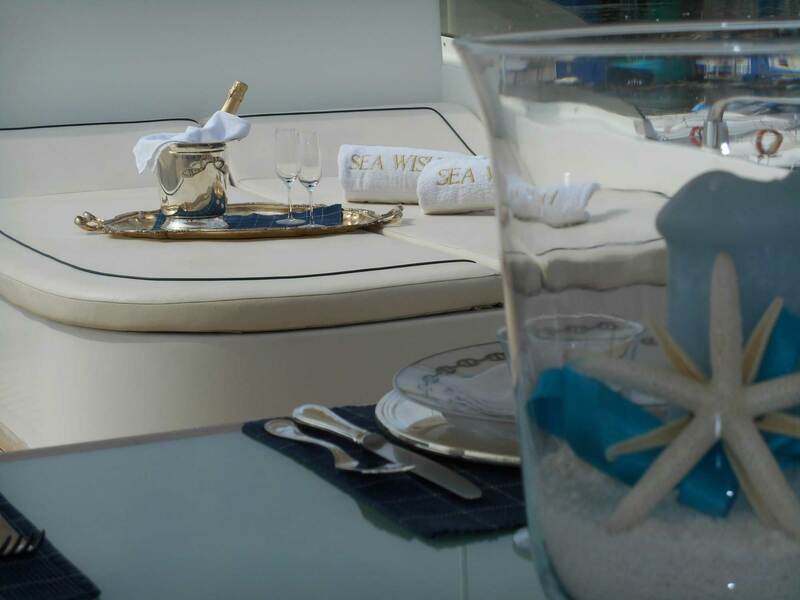 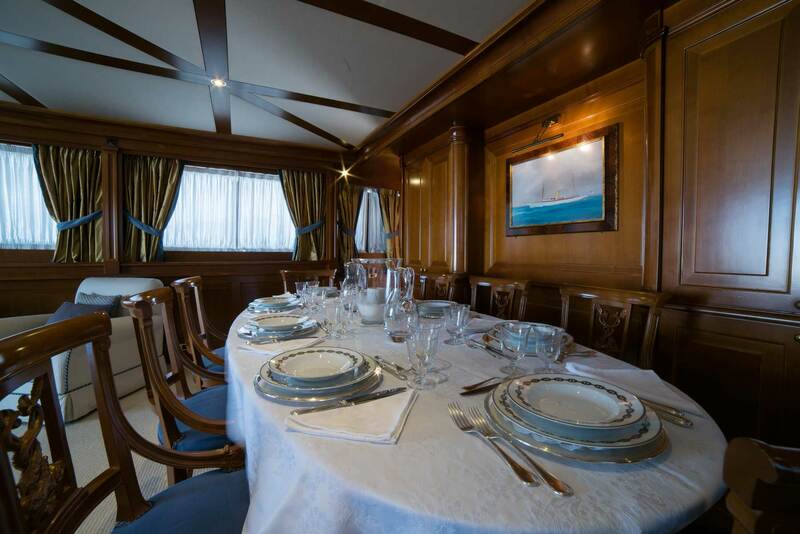 Indoor dining can be enjoyed in the forward part of the yacht ’s saloon, where you will find the crew access to the galley making serving much more efficient. 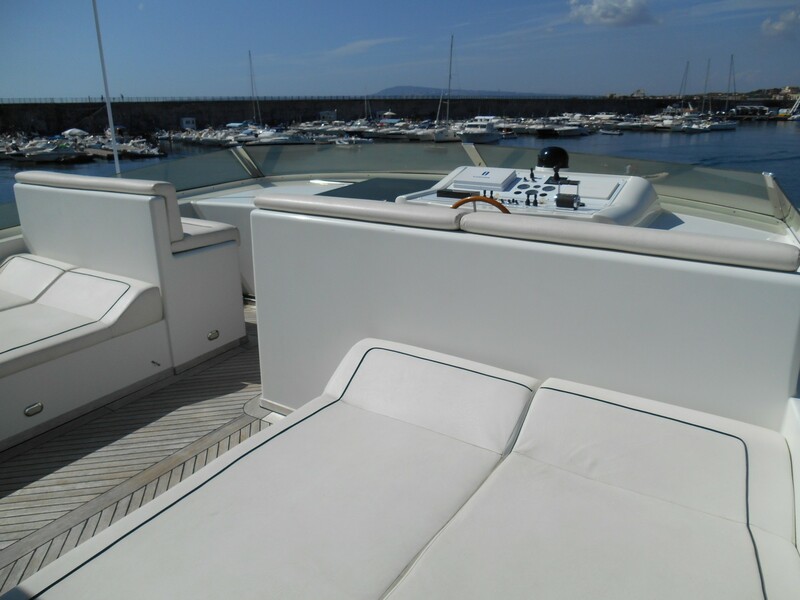 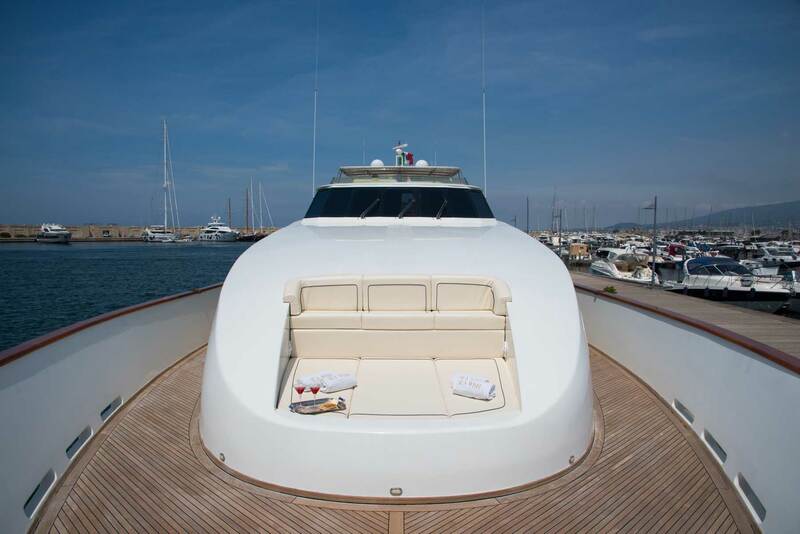 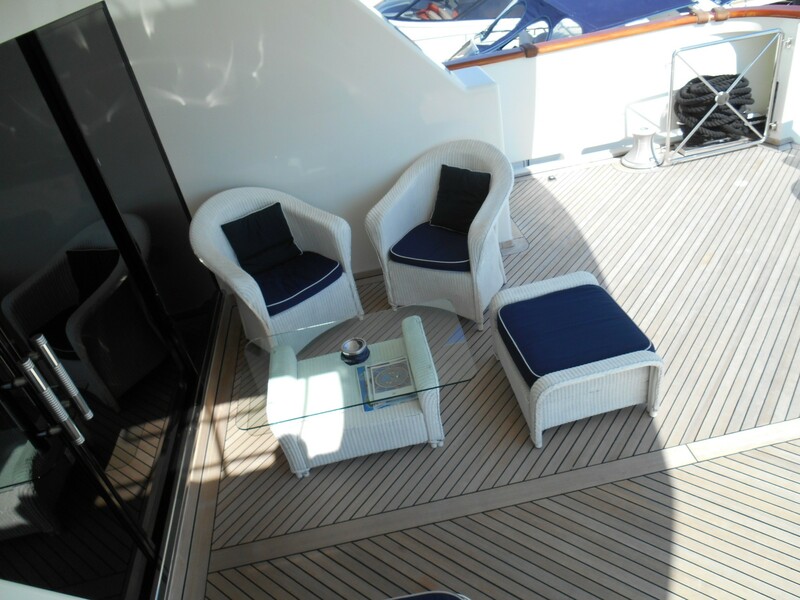 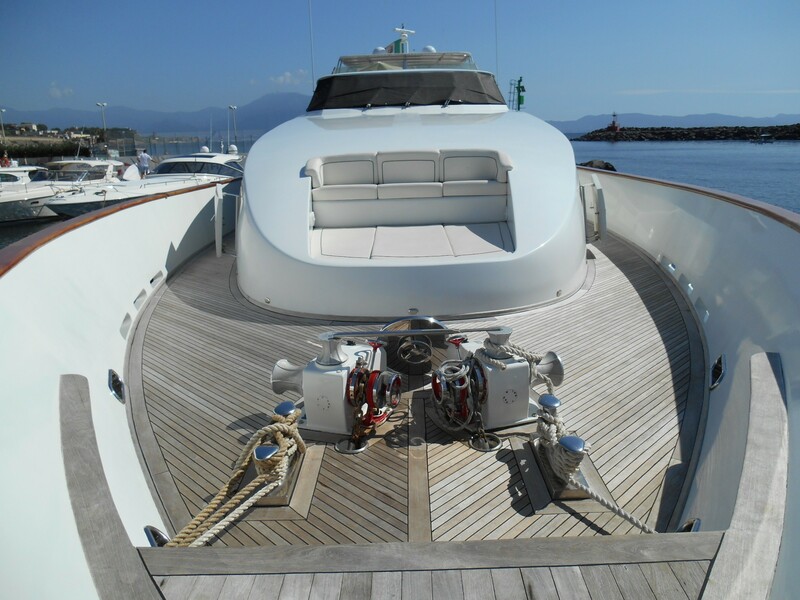 The aft deck is partly covered and offers comfortable outdoor furniture as well as a fixed sofa. 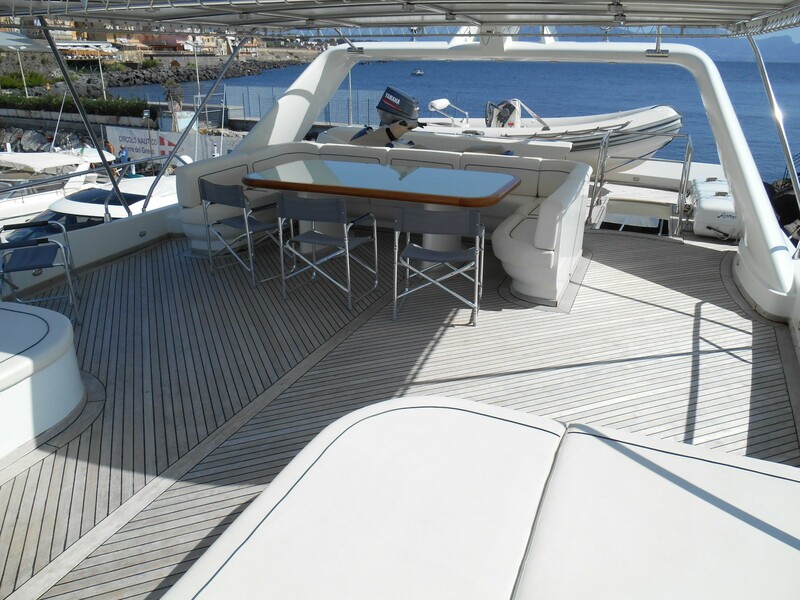 The generously sized swimming platform is accessible by port side and starboard side steps. 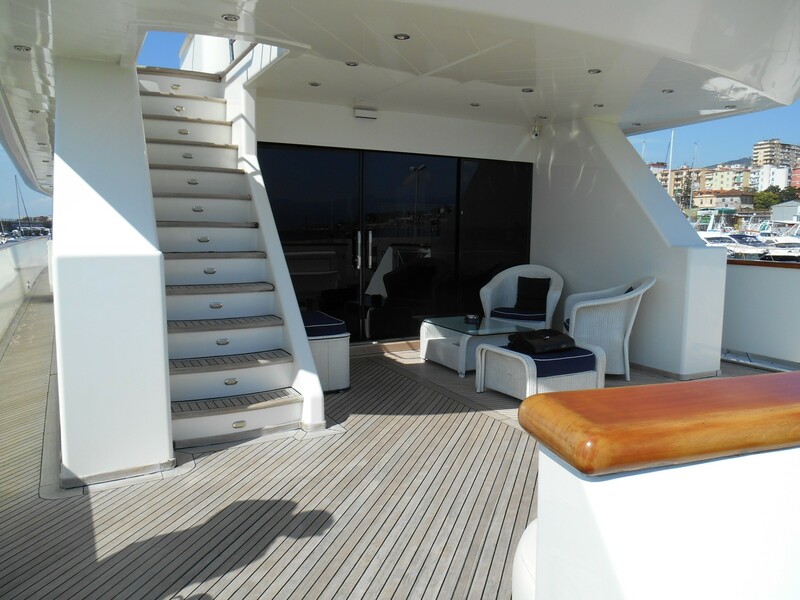 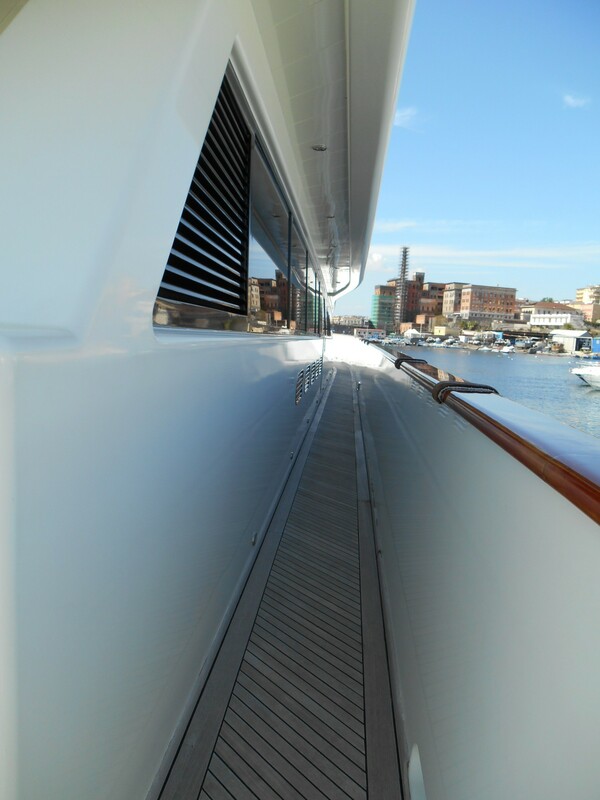 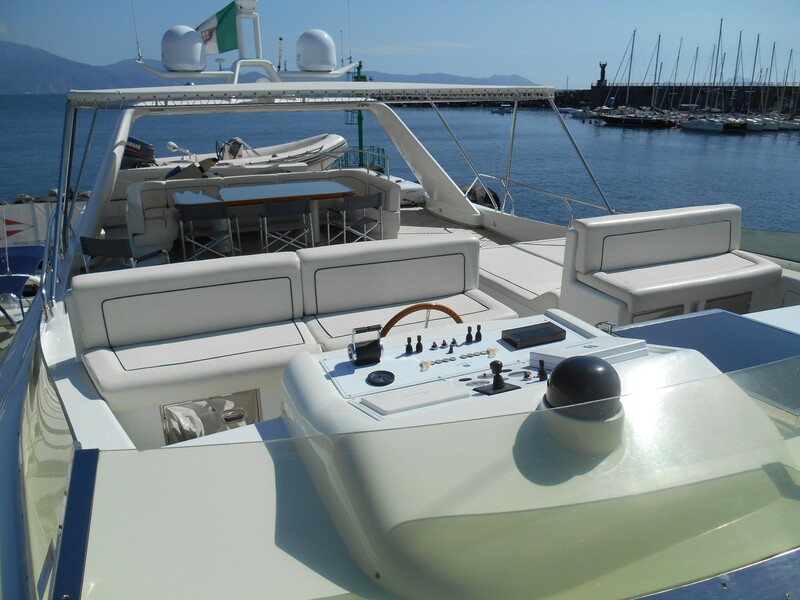 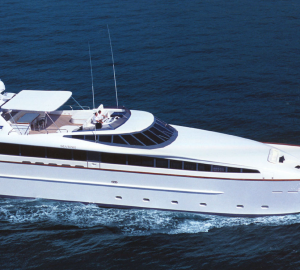 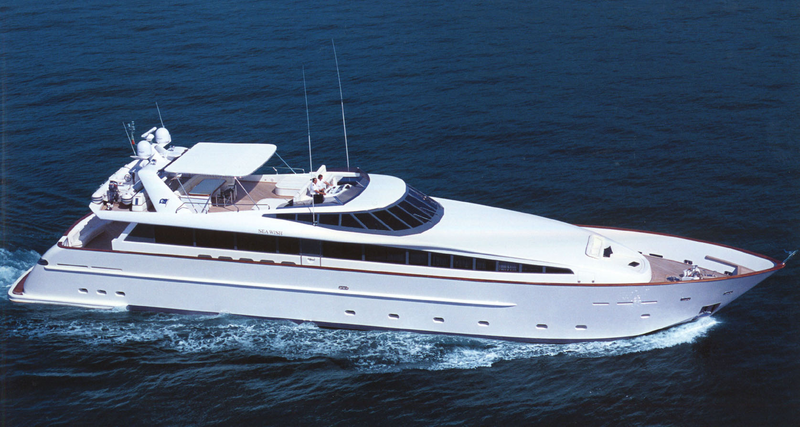 The aft deck gives access to the forward sun deck as well as to the upper deck. 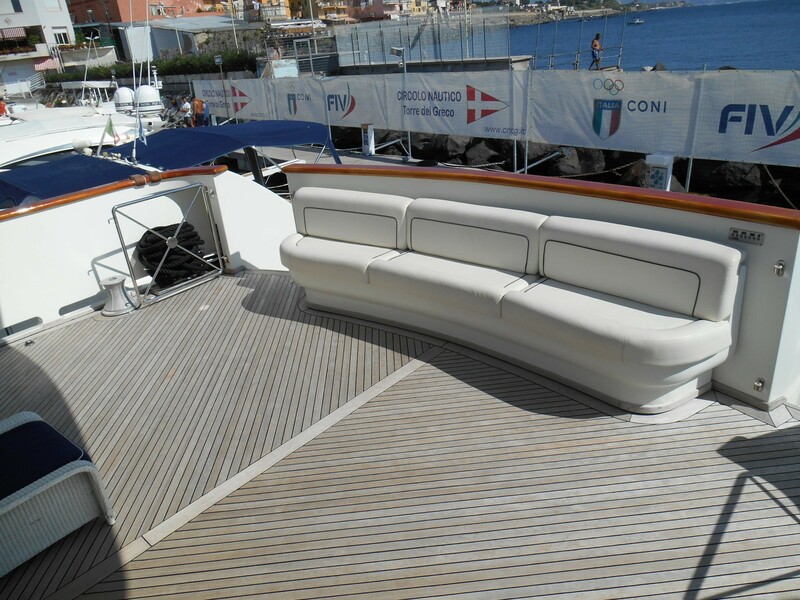 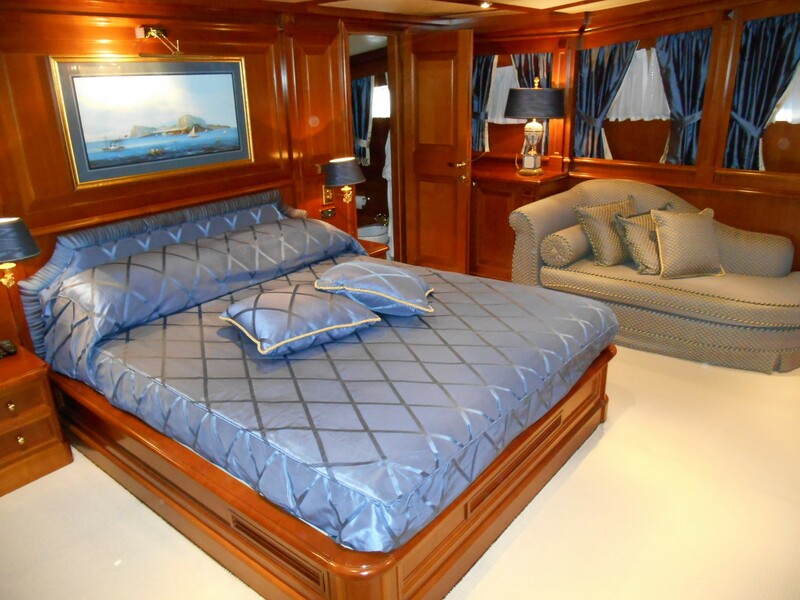 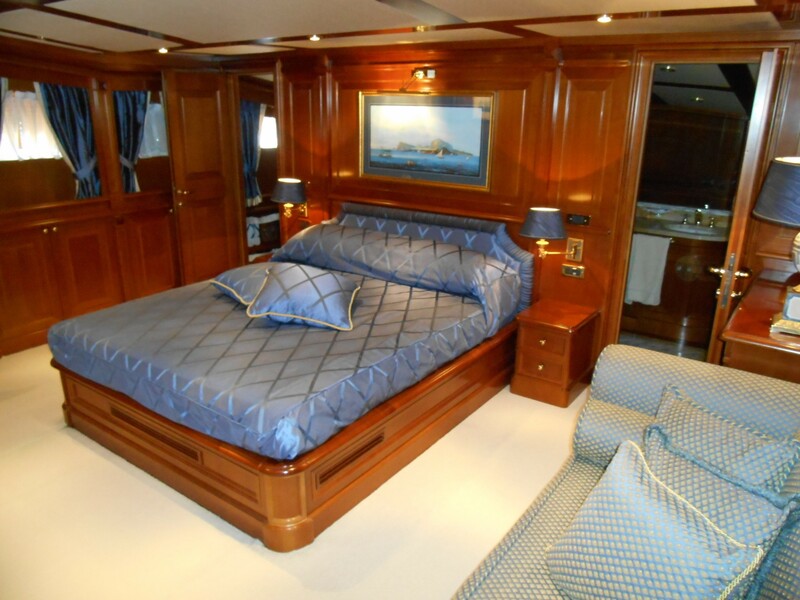 The forward deck offers a sofa and a sun mattress. 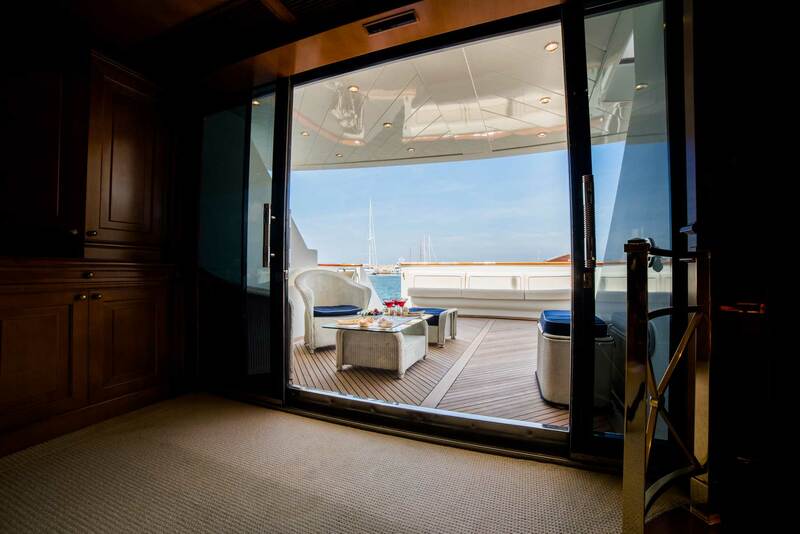 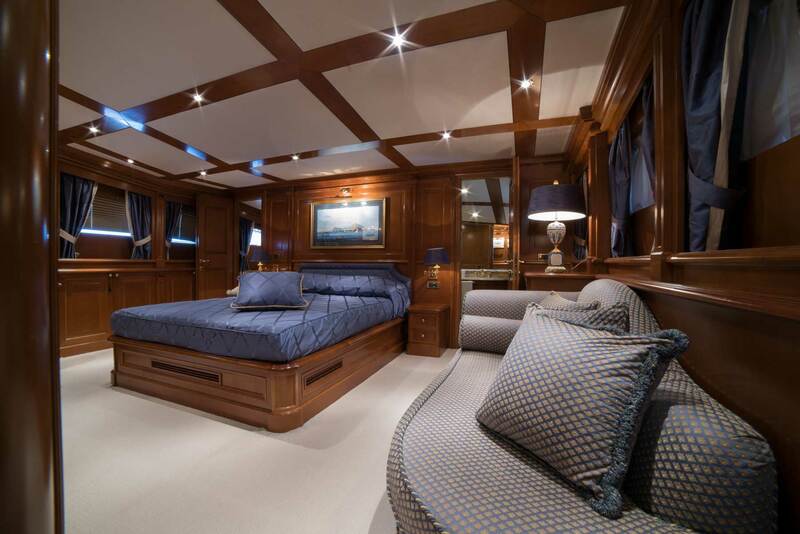 The upper deck, accessible from the interior or from the aft deck, is the main exterior living area. 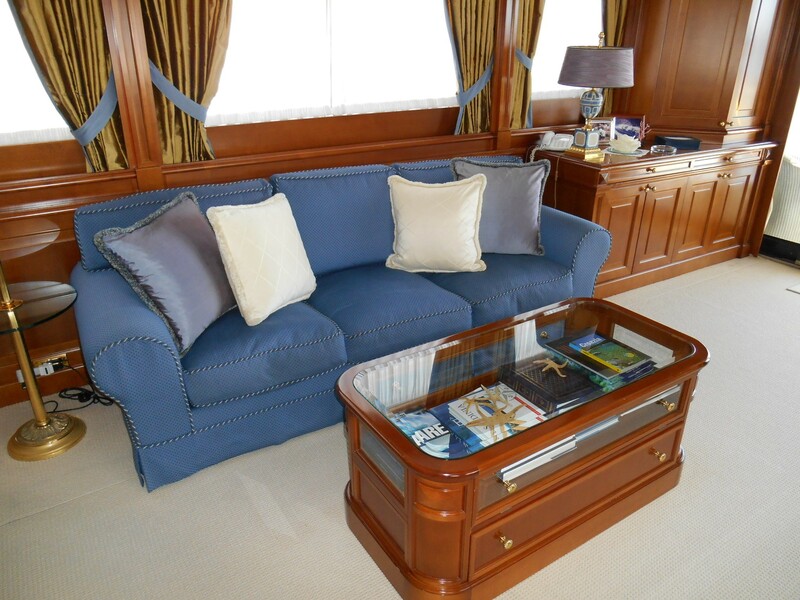 Forward are two raised sofas allowing guests to enjoy navigation. 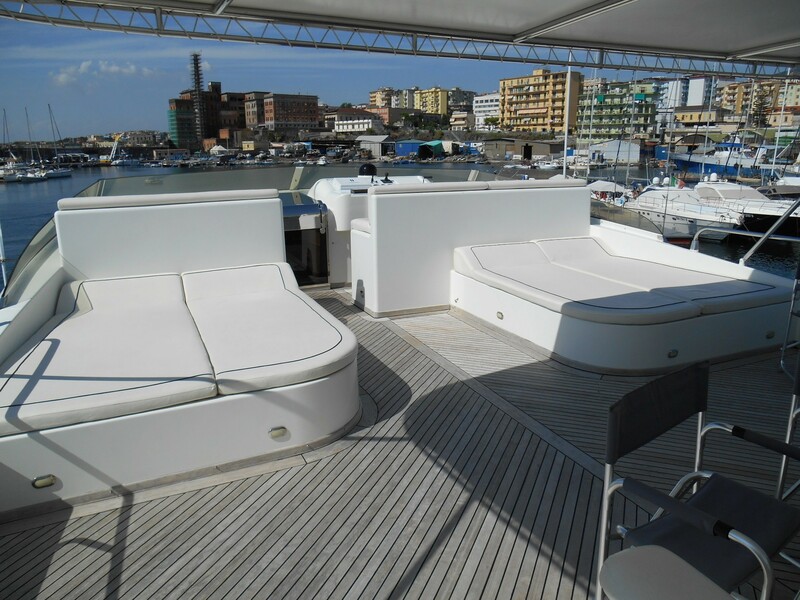 Behind these are two large fixed sunbeds, well sheltered from wind. 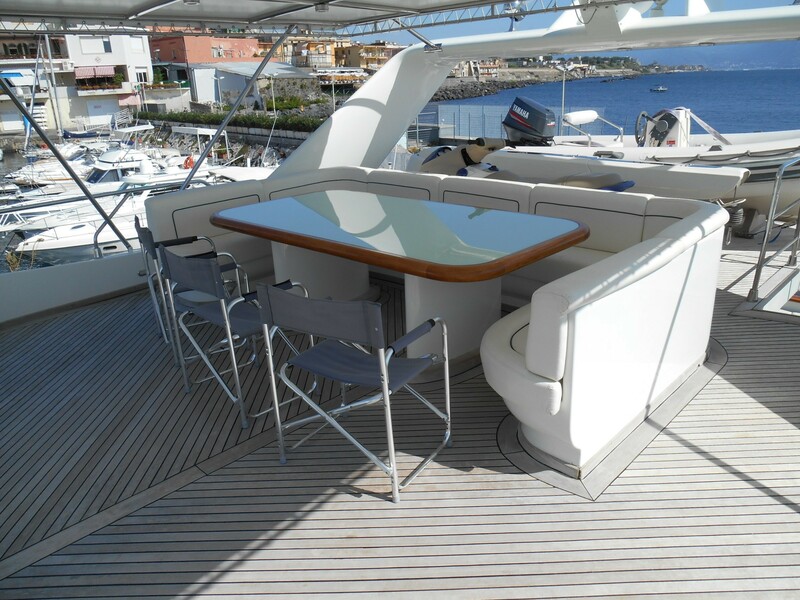 A large dining table easily accommodates 12 guests for lunch/dinner. 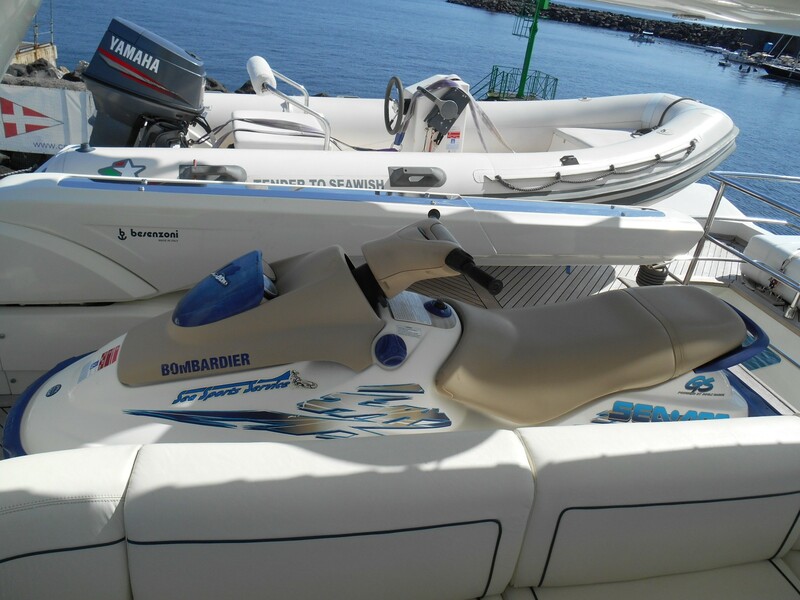 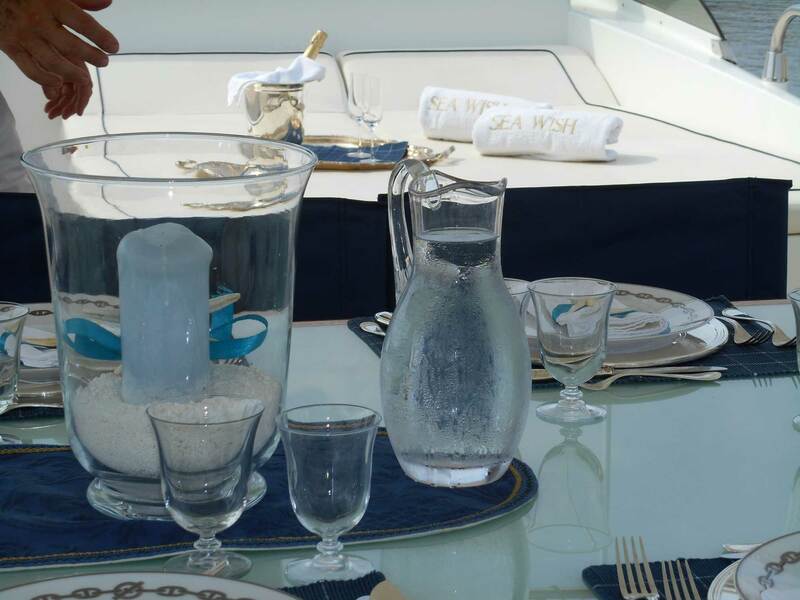 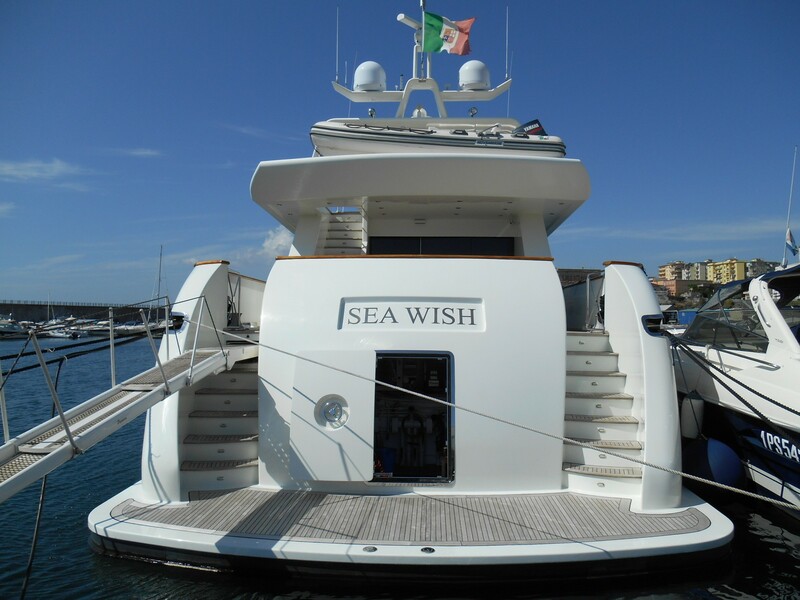 SEA WISH's tender and jet ski are separated from the guest area and can be launched without interfering with owner or charter guests. 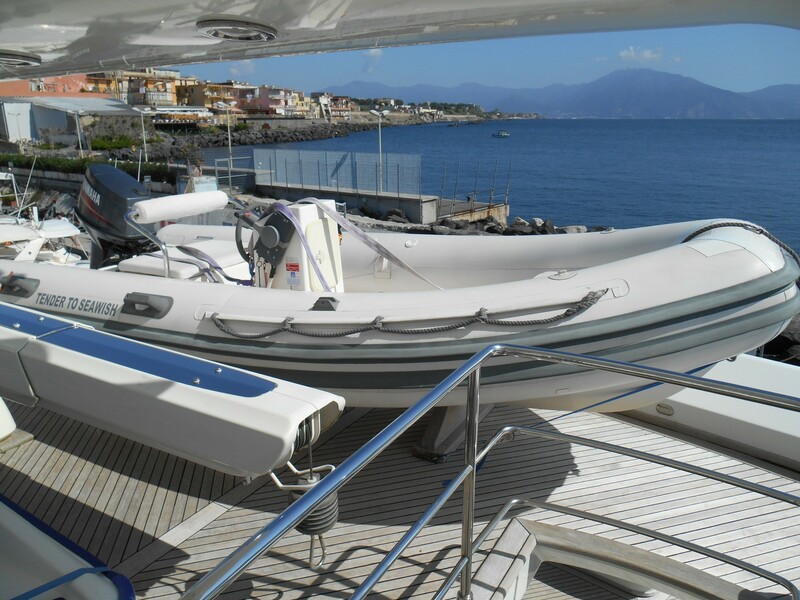 Her swim platform can be accessed from both starboard and portside and creates a safe landing for both swimming and arrival on board by tender. 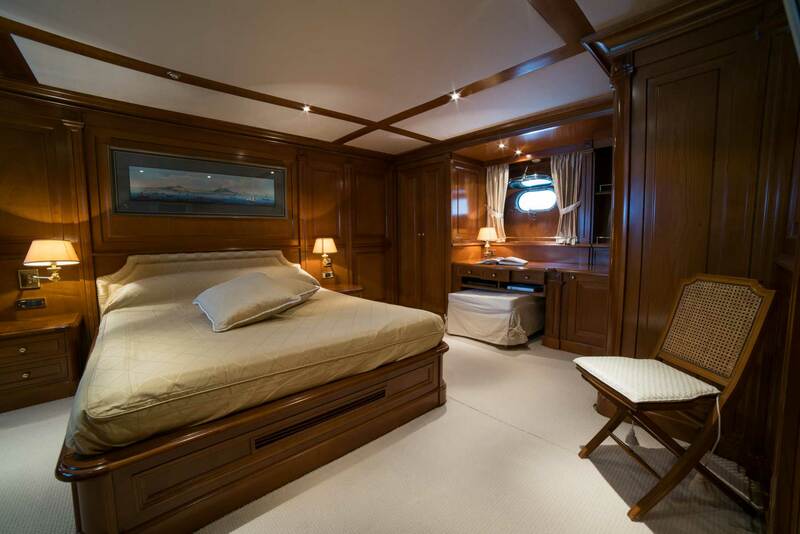 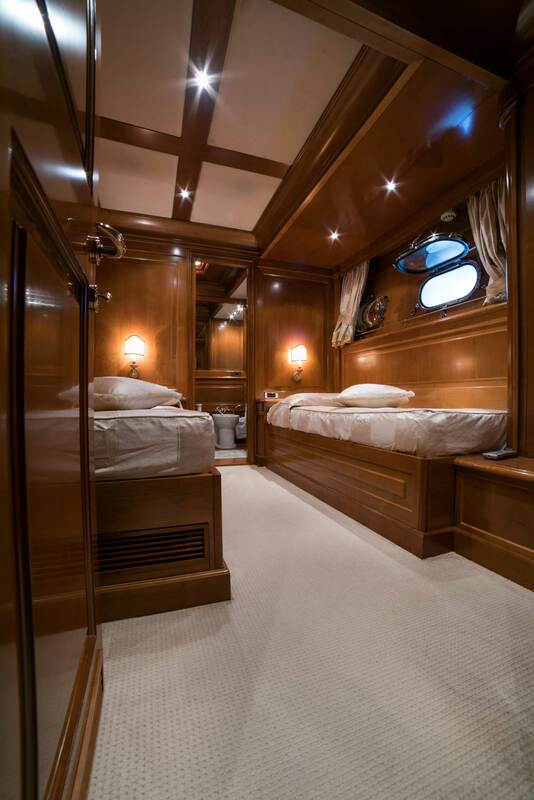 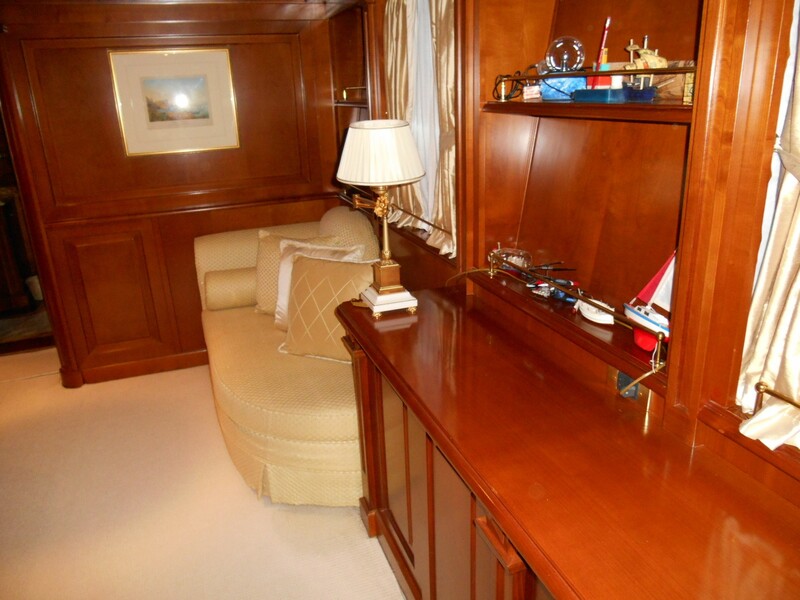 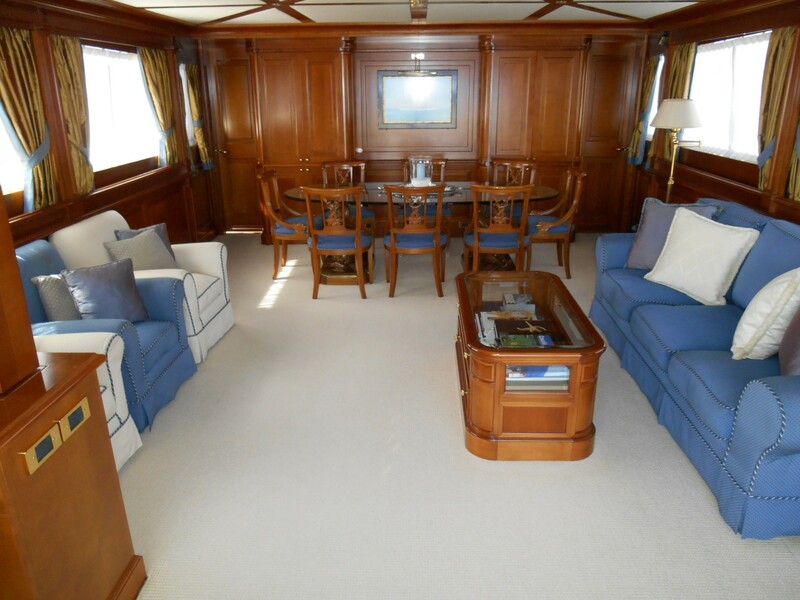 The master cabin on the main deck has large windows that allow for a lot of natural light, as well as a nice view. 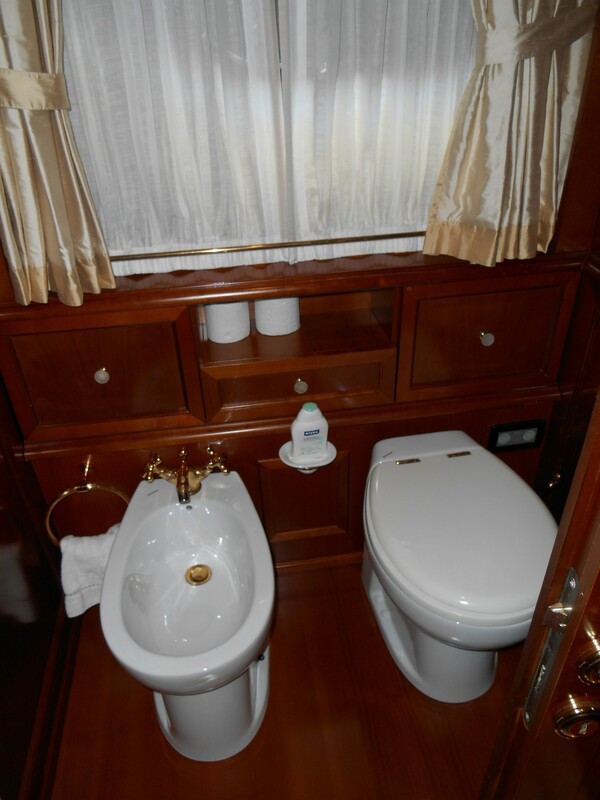 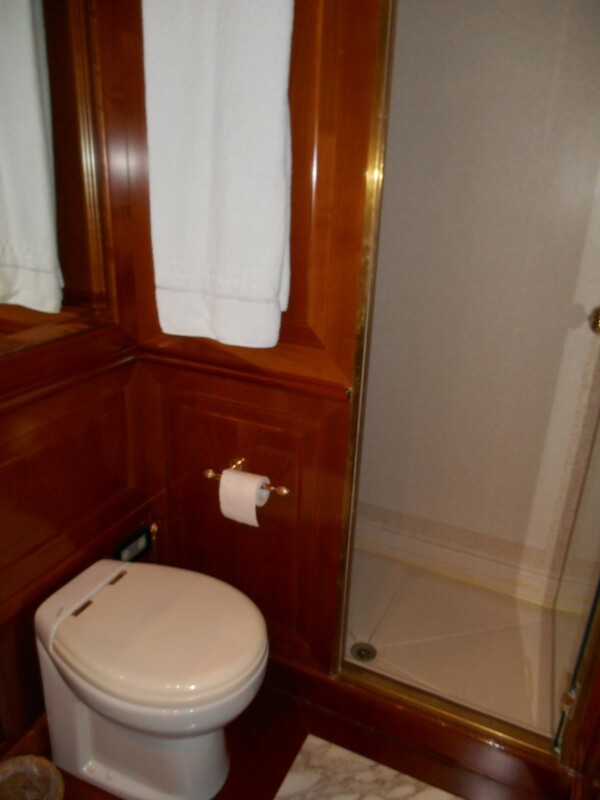 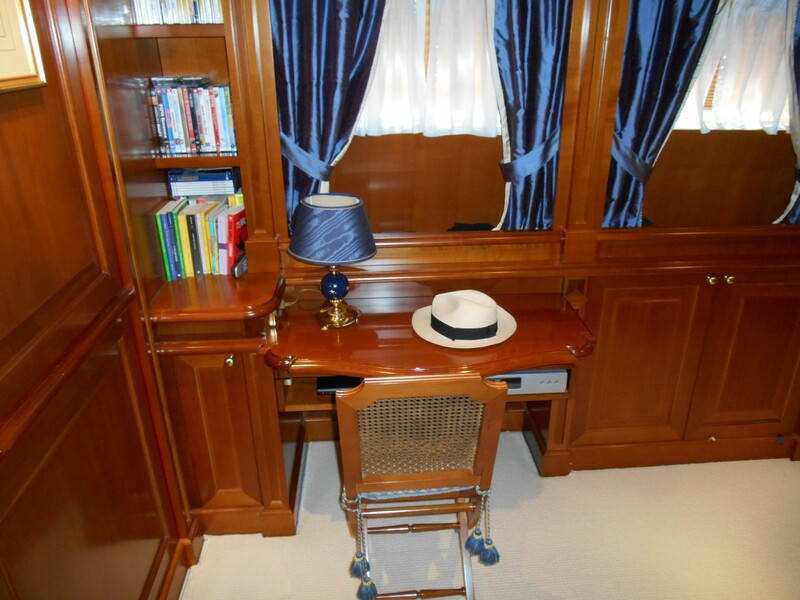 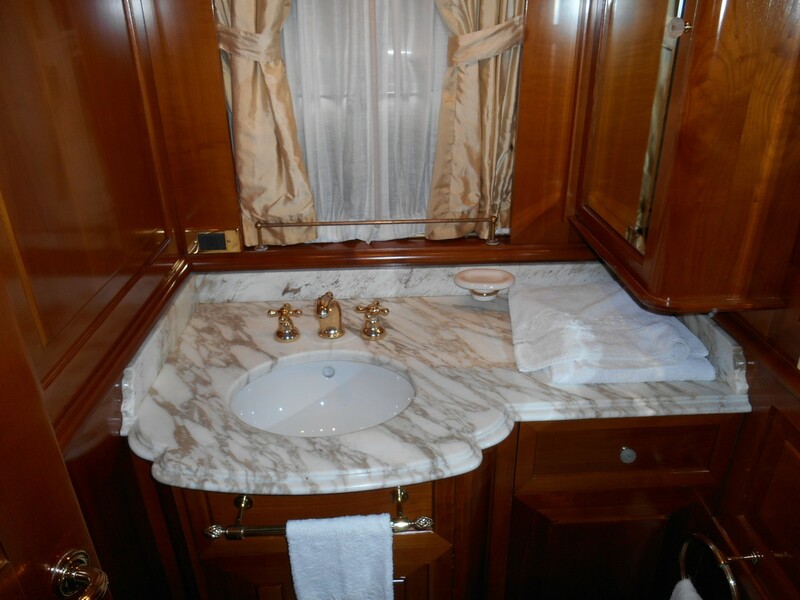 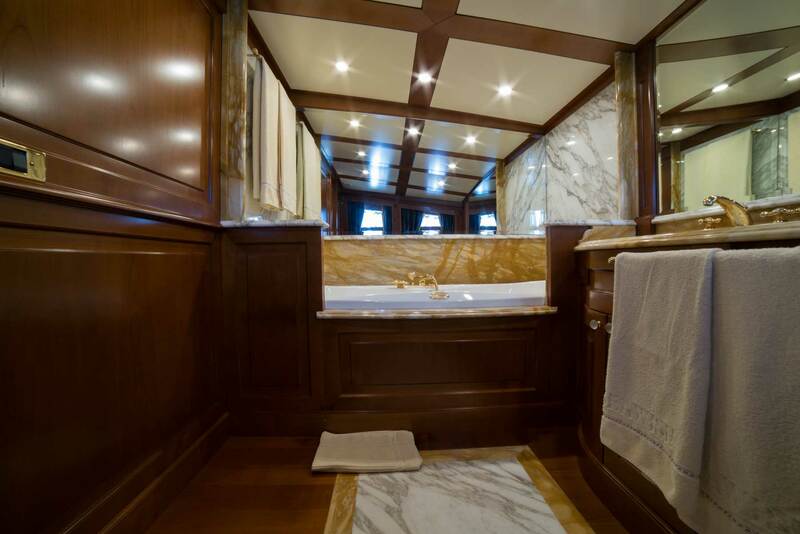 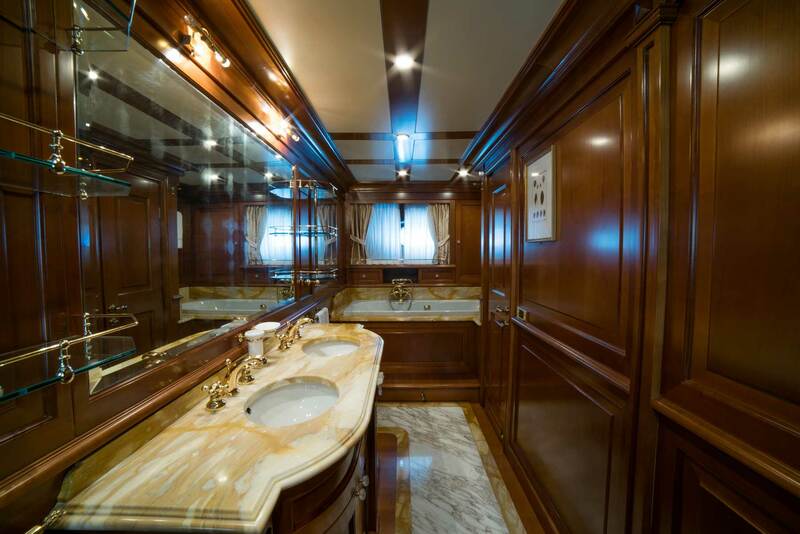 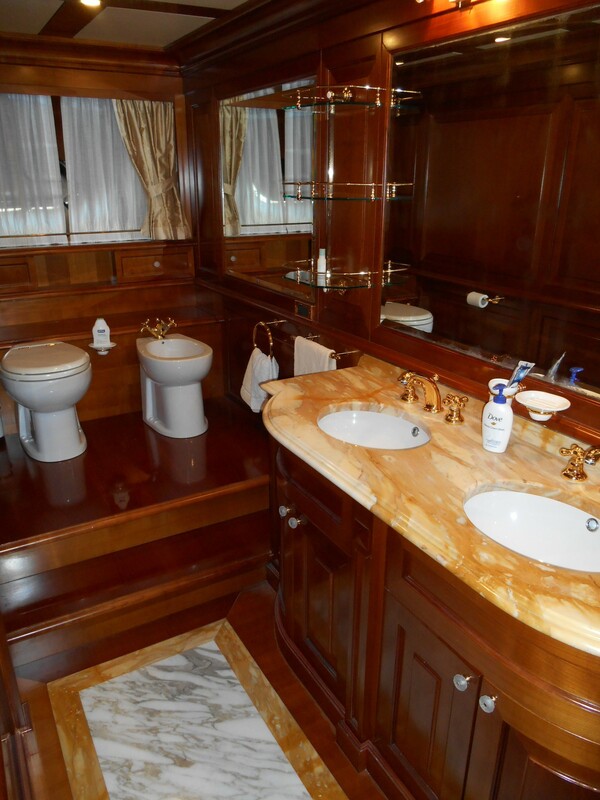 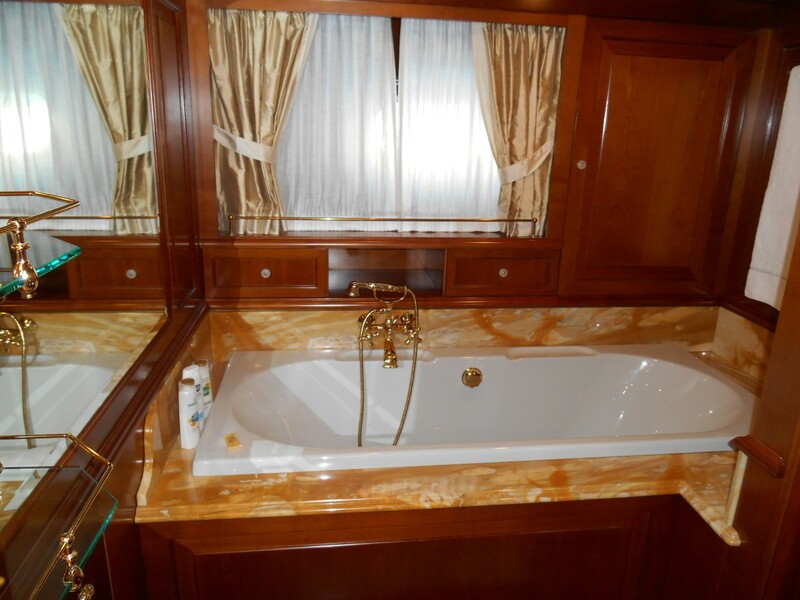 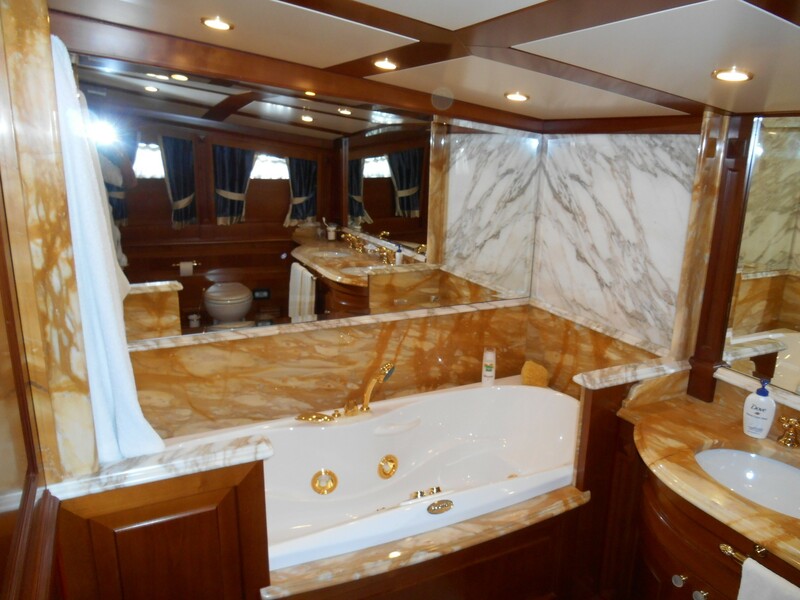 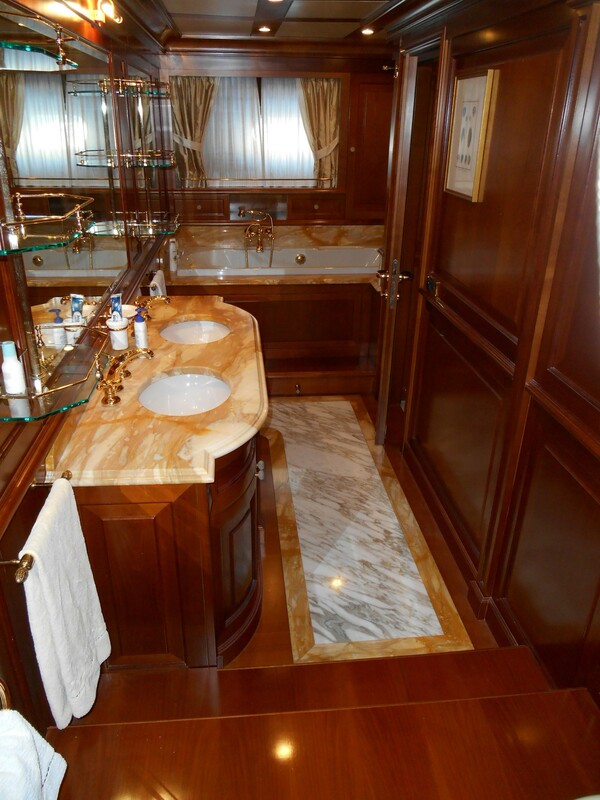 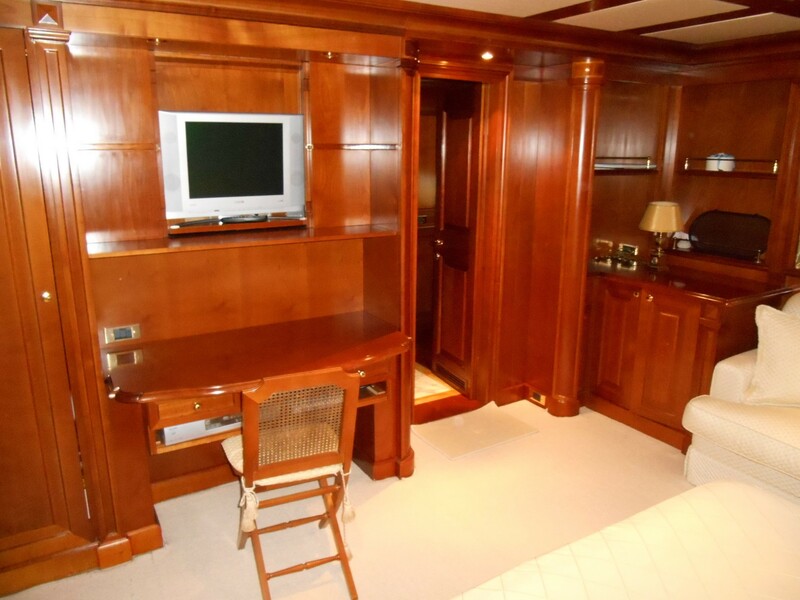 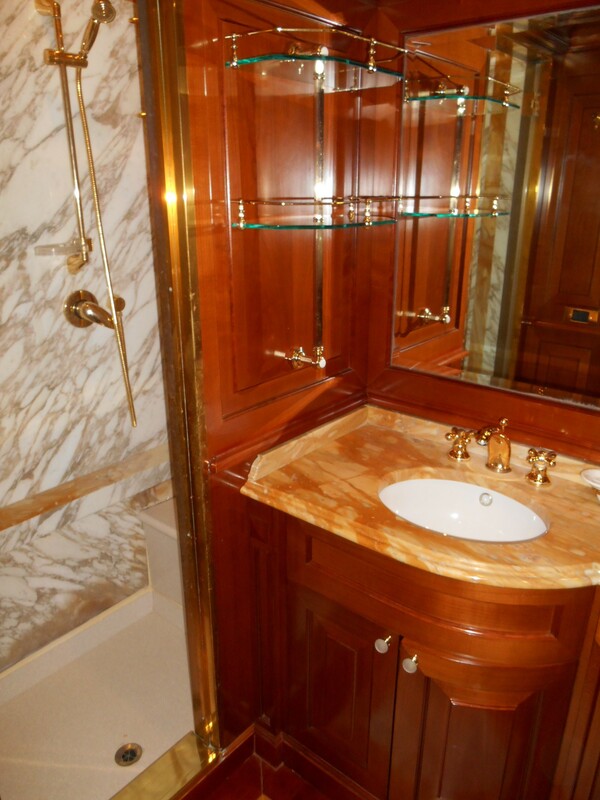 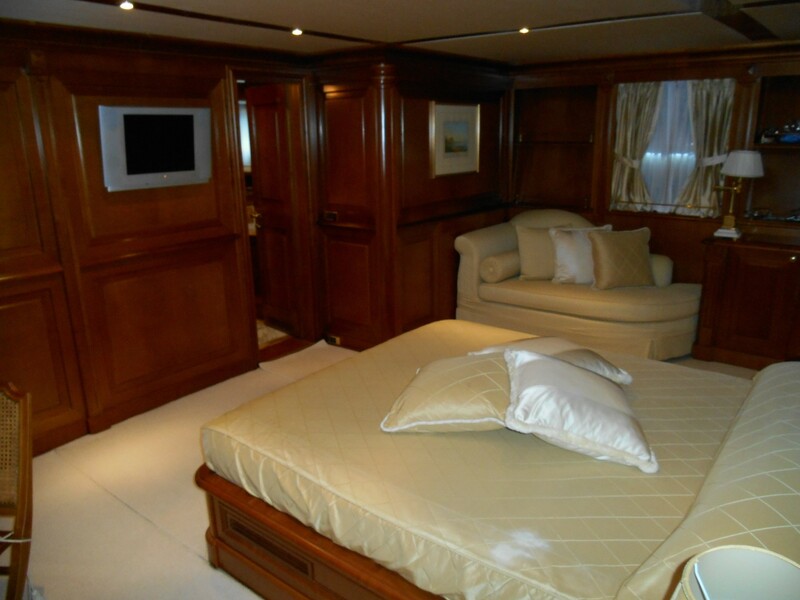 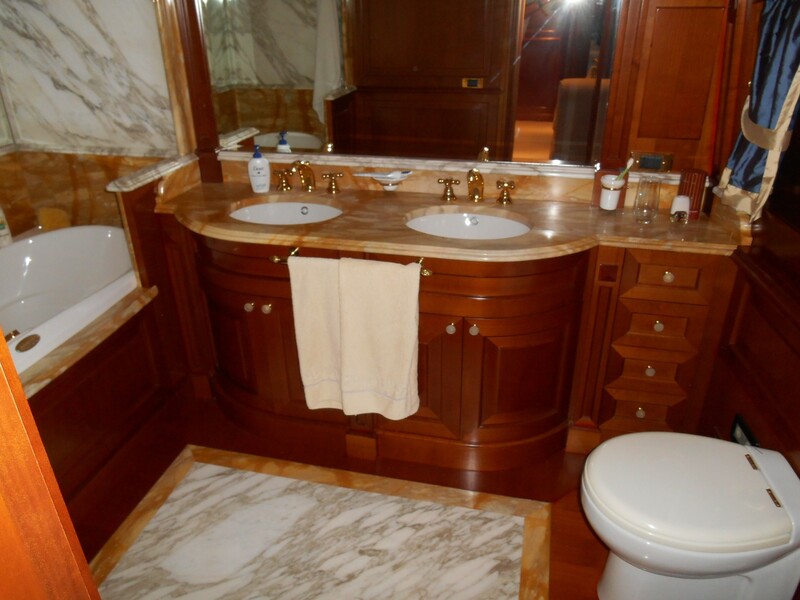 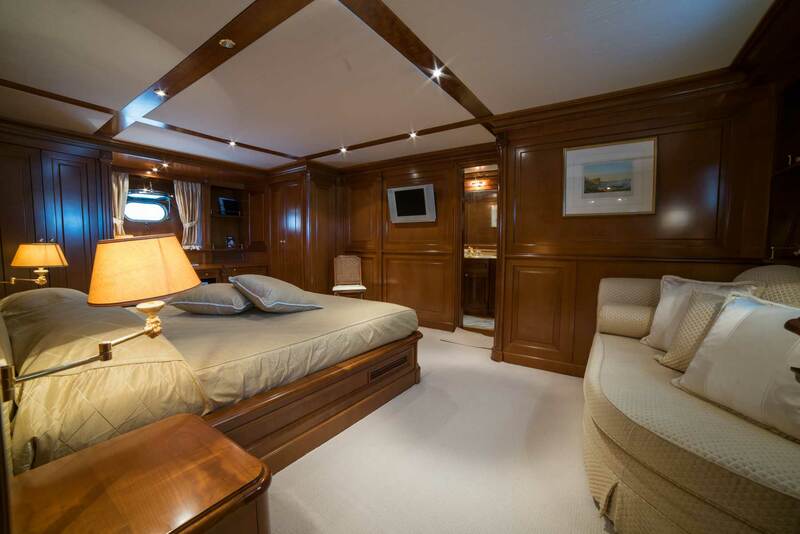 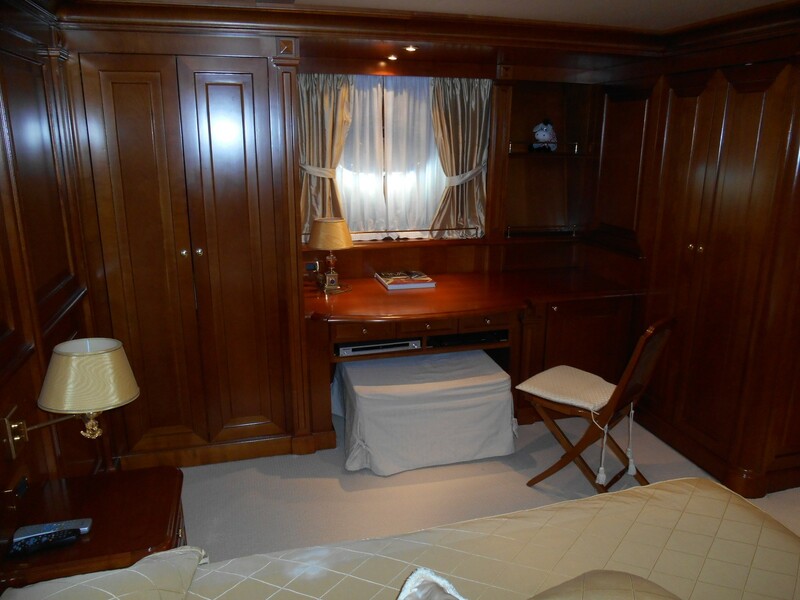 It features a writing desk and a sofa and a large dressing room portside; very comfortable bathroom with a Jacuzzi bathtub, dual sinks, toilets and bidet starboard side. 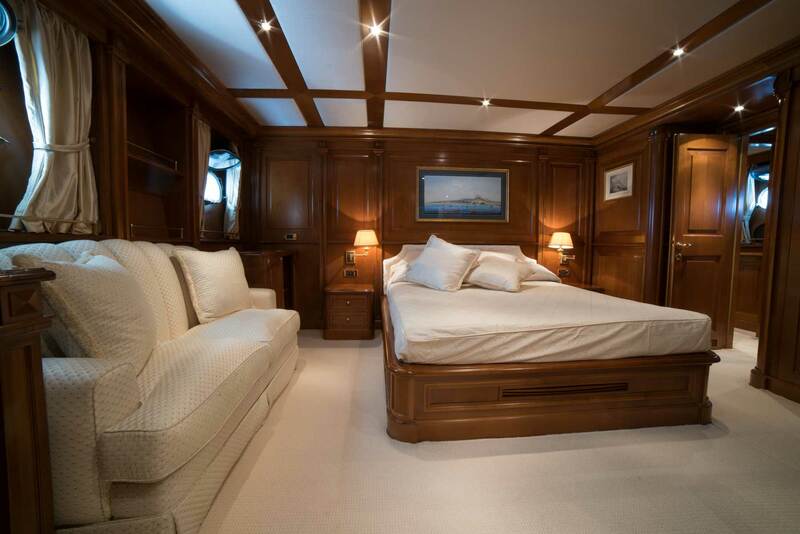 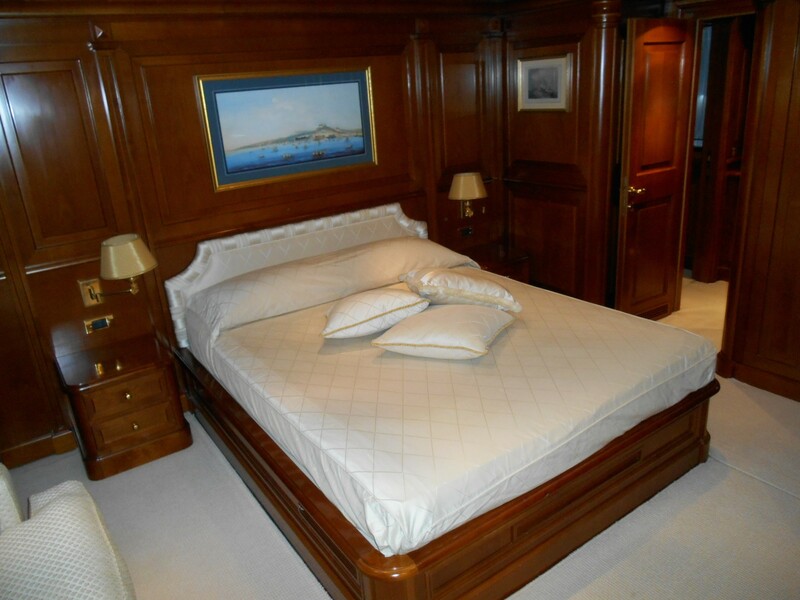 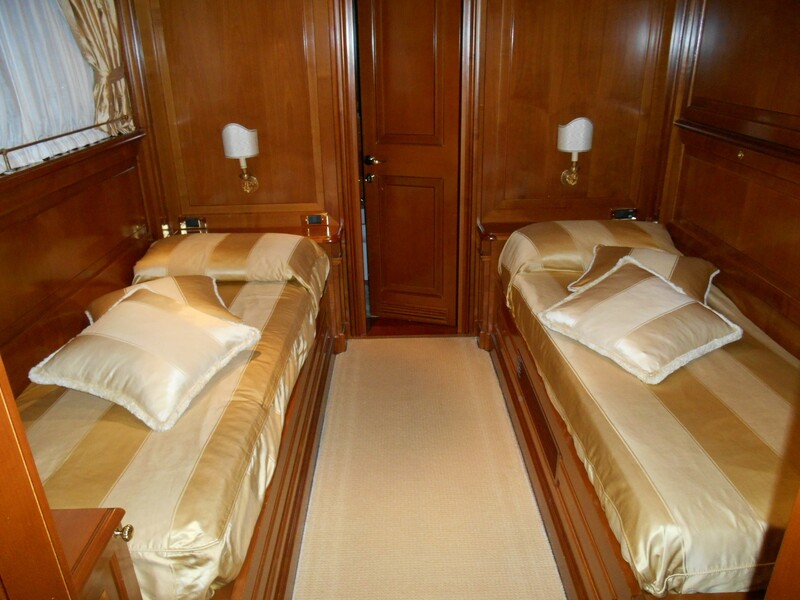 The four guests suites are on the lower deck: 2 amidship VIP suites with Queen size double bed each. 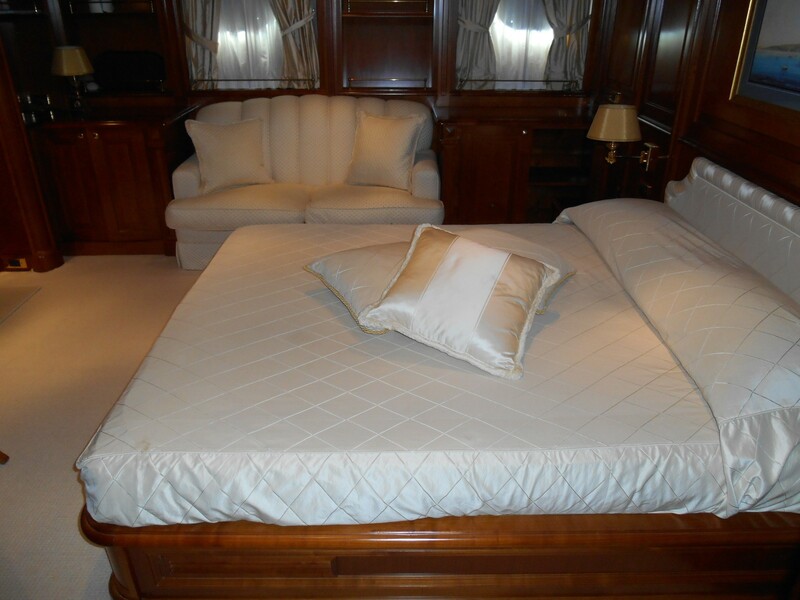 Both VIP staterooms are well-sized with Queen size beds, sofa, writing desk and large wardrobes as well as generously sized bathrooms, 1 with bathtub, 1 with shower. 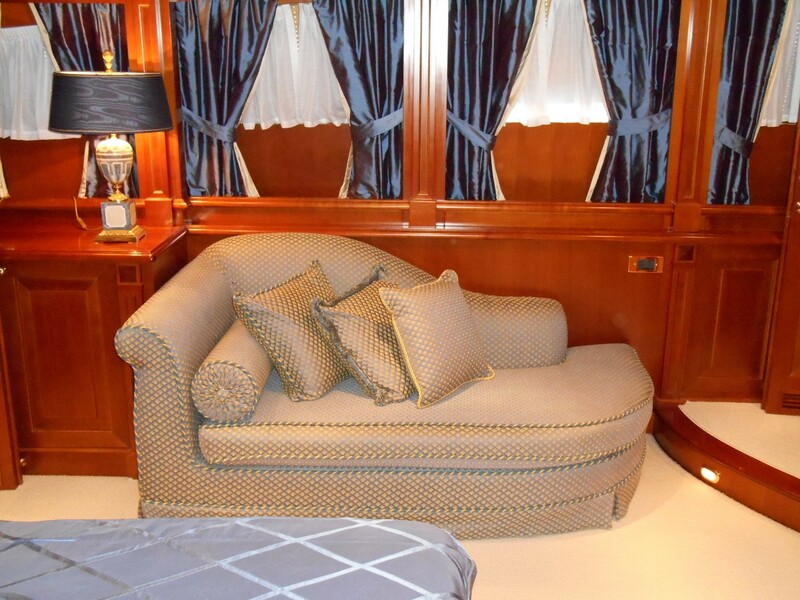 2 aft twin suites with separate berths and additional Pullman berth each. 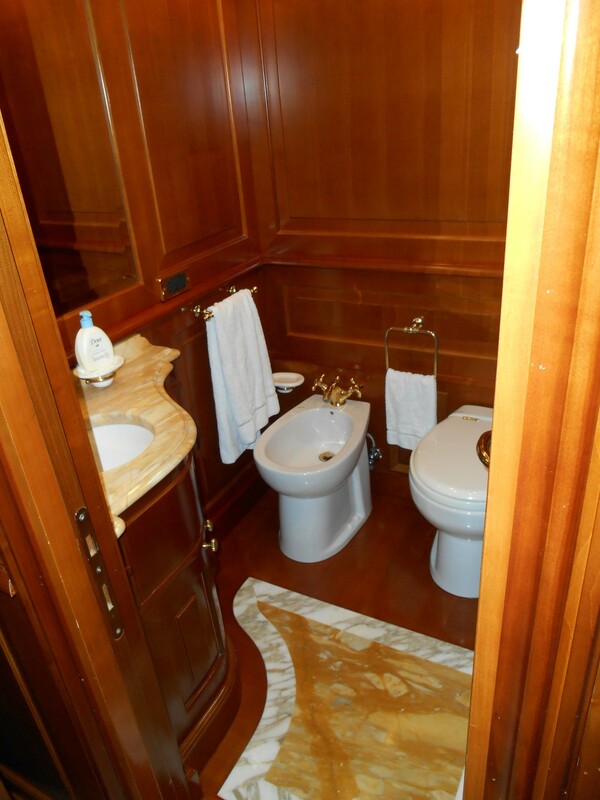 Ensuite toilets are available on both twin suites.